Chief Financial Officer and Senior Vice President Elizabeth Blose has a strong background in the finance and banking industry. She holds a Bachelor of Science degree in Economics and a Master of Business Administration degree with an emphasis in Finance. Not surprisingly, Blose is a vocal proponent of data-driven decision-making. Blose was a finance executive at Honeywell International for approximately 15 years. From 2001 to 2013, she was an executive vice president and CFO at INTRUST Bank in Wichita, Kansas. In 2014 she added Personal Lines Insurance to her finance repertoire at Frost Bank. 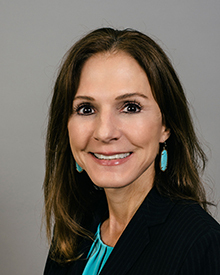 From 2015 to 2017, Blose worked at Pioneer Bank in Austin as an executive vice president and CFO. Her leadership philosophy stresses the importance of “practicing what you preach” and she believes in setting an example by working alongside her team. Involved in the community, Blose is a sponsor and guest judge for the local high school business program, DECA. Blose is a Pitsburgh native and a die-hard Steelers fan — regardless of the team’s recent performances. She considers herself an, “east coast girl” and loves getting into what she calls, “sister mischief” when getting together with her older and younger sisters. Married now over 30 years, she’s the proud mother of two now-grown Austinites and loves spending time with her beloved dachshund.